In Murungasyaya, a few villages away from Beliatta, the seat of Rajapaksa power, the king coconut seller scrunches up her face and furrows her eyebrows. Sharmali Subashini is trying to recall which party had been able to muster the bigger crowd at back-to-back rallies in Weeraketiya this week. Finally she decides it’s too difficult. “Mr. Sajith Premadasa had a huge crowd at his rally two days ago. But then yesterday, the sandhanaya rally was also very big. Janadhipathithuma came for that meeting so people came from everywhere to see him,” she explains. Janadhipathithuma is not President Maithripala Sirisena of course. In regions that have favoured the UPFA in dozens of recent elections and especially in Mahinda Rajapaksa’s home base of Hambantota, there is still only one Janadhipathithuma. Rajapaksa had been president for so long, and stamped his presence so thoroughly around this remote southern district, there isn’t much room for anyone else. But there is a difference this time, Subashini admits. “I’ve never seen the UNP activists work so hard. It’s like they were sleeping all this time or scared to come out during elections. Suddenly they are everywhere – I think that’s why both parties have support in this election. This time it’s a real fight,” she explains, casually splitting king coconuts with a huge mallet so that her customers can dig into the soft flesh inside the nut after consuming the water. The remote village deep inside the rural district is split down the middle, the woman says, with UNP Deputy Leader and Hambantota District candidate Sajith Premadasa also popular in the region. Middeniya is one village over and even closer to Beliatta. Here support for Rajapaksa is much more potent. “He is from this village, the people here prefer to vote for the game miniha says G.K. Champika, who runs a grocery shop in the small town. “Yesterday in Weeraketiya, it was the Mahinda sulanga (winds) that was blowing,” gushes Bennet Indika, a jeweller in the Middeniya town, quoting a famous slogan of the Rajapaksa campaign. The UPFA rally featuring the former President had five times the crowd that had attended Premadasa’s rally, Indika claims. Three members of the Rajapaksa family are contesting in the Hambantota District at Monday’s election. His son Namal, his brother Chamal and his niece Nirupama are all candidates in the district race. Namal Rajapaksa, the former President’s eldest son, topped the preferential list in the district in the 2010 parliamentary election, a contest held four months after Mahinda Rajapaksa won big in presidential elections held in January the same year. In 2010 the Rajapaksa star was shining at its brightest, less than a year after Government troops defeated the LTTE in battle, ending a 26-year civil war. The August 2015 parliamentary battle is a completely different story. 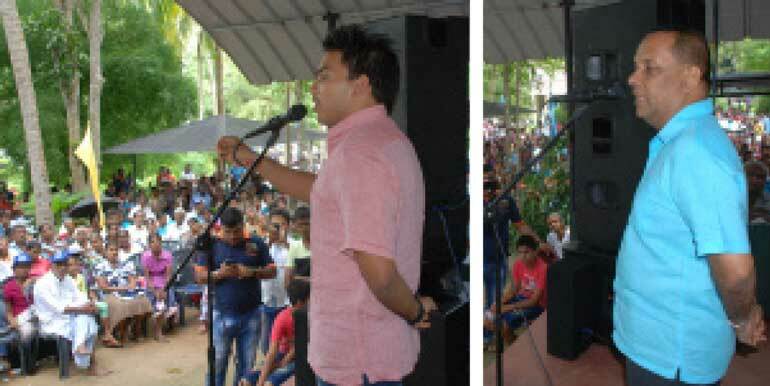 Former MP Namal Rajapaksa, used to campaigning with an entourage of loyalists, buses and jeep convoys, is running a lonely campaign in his father’s hometown. “This time we have to play the Opposition ball game,” says Rajapaksa the younger, seated in the foyer of his Carlton family home in Tangalle. “Last time the mistake we made was being so sure we would win by 2.5 million votes. 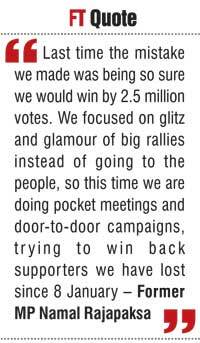 We focused on glitz and glamour of big rallies instead of going to the people, so this time we are doing pocket meetings and door-to-door campaigns, trying to win back supporters we have lost since 8 January,” the former President’s son explains about his much quieter campaign in the district. Carlton is a museum of Rajapaksa family memories, its crowning glory placed at the very entrance to the house, features Mahinda Rajapaksa taking oaths as President of Sri Lanka for the first time in November 2005. A much younger Namal Rajapaksa stands close by, with his younger brothers Yoshitha and Rohitha beside him. On the foyer wall, hangs a framed portrait of Rohitha Rajapaksa, in full nilame costume. Namal indignantly denies allegations that President Rajapaksa’s family was his Achilles’ heel. “Was our crime the fact that we didn’t go to nightclubs and get into fights,” says Namal on allegations that the conduct of his siblings may have led to their father’s shocking defeat in the January election. But even he admits that the huge anti-Rajapaksa propaganda wave has affected his electoral fortunes slightly. “The Rajapaksa surname is a problem because of the mudslinging,” he claims. Carlton House is by no means empty, but it’s not overflowing with Rajapaksa supporters and vehicles the way it once was during election season, residents in the area claim. On Wednesday (12) morning, Rajapaksa stops by at an election meeting organizsd by fellow candidate Mahinda Amaraweera. Amaraweera aides say Rajapaksa had called the candidate and asked if he could speak briefly at the meeting, which had attracted a considerable crowd. His popularity in this election is causing chatter about the fact that the Rajapaksa family had suppressed his electoral fortunes in the 2010 poll, when Amaraweera came in second to Namal Rajapaksa in the district. Speaking about Rajapaksa fortunes in Monday’s election, Amaraweera says that Mahinda Rajapaksa is still very popular in Hambantota. “But just because he is popular, that doesn’t mean that his family is going to get all the votes, not this time,” he says. Amaraweera, who accepted a ministerial portfolio in the Sirisena Government, is emerging as the UPFA front man in the district, even as the Rajapaksa star loses lustre in the area. He tells Daily FT that he had managed to swing the UPFA’s fortunes in the Hambantota District by the final week of campaigning, with many party supporters being brought back into the fold. “At the beginning to be honest, we were quite worried. Sajith had made major inroads into the district while the SLFP was having problems. Now we’re confident we can win, Tissamaharama was difficult, but now even that is looking good,” Amaraweera said. “If we lose Hambantota, we lose the election islandwide,” the Minister said on Wednesday. Amaraweera supporter Ramani Jayanthi who attended the meeting, said she was sure the Minister would top the Hambantota list in this election. “This time it won’t be the Rajapaksas on top,” she says smiling confidently. Hinting broadly at the Rajapaksa campaign, Amaraweera claims that there were some factions within the party that initially went around the district telling people not to vote for those who had accepted ministerial office in the Sirisena Government. “Then when they realised that the UNP was getting stronger in the district, they got worried and stopped that tactic,” he explained. Sajith Premadasa is reported to have made serious inroads in the district, where he is already a significantly popular politician. Over the period of this election campaign, Premadasa has addressed over a thousand pocket meetings, in tiny villages and grama sevaka divisions in the remote district. On Wednesday, Premadasa was tackling the Katuwana divisional secretariat, with its 184 GS divisions. His convoy of jeeps manage to ply the narrow roads and steep hills that lead to the meetings, often held in the home of the local organiser. In Kongasthanna, Premadasa gets out of his vehicle and treks up a rugged uphill path, muddy from recent rain to reach his 29th meeting of the day. The crowd of about 50 people go crazy at the sight of their beloved ‘punchi ali patiya’ walking up the steep hill. “I promise you that I will bring the national leadership to your doorstep and lay it at your feet someday,” he pledges, urging people to support him in Monday’s election. Premadasa tells the meetings that the 12,000 job vacancies in his Ministry will be reserved for the Hambantota District and he promises housing assistance and subsidies. Premadasa insists that he wants to take at least four or five members to Parliament on the UNP ticket at this election. For once it is his party that is rift-free and taking a strong united stand. While the Rajapaksa family has their bastions of power in the district, the Premadasa legacy also holds strong in the region. Hambantota is filled with beneficiaries of Ranasinghe Premadasa’s successful Janasaviya program and long before the Rajapaksa regime began building roads in the remote district, it was roads built during President Premadasa’s tenure that connected the rural interior to townships in the area. Heir to this still potent legacy, Premadasa Junior is able to muster considerable crowds at his rallies and is cautiously optimistic about the UNP’s fortunes in Hambantota. His party activists claim it is the first time in years that they have felt safe about working openly for the UNP in the Hambantota District. In recent elections, the UNP has found it difficult to maintain even party offices or mark any kind of presence in the Rajapaksa stronghold. Even die hard Rajapaksa supporter Indika admits this election campaign has been completely unlike any others he has seen. “There are no posters or cutouts anywhere, I can’t believe it. It has been so peaceful,” he says. Asked if it’s more peaceful than elections were in his hero’s time, Indika grudgingly admits that is true. “I suppose we have to say that much for this Government,” he says. Forecasts for the Hambantota district show a tight race, with a slight edge for the UPFA. The alliance is likely to secure a majority, but it is increasingly uncertain if a Rajapaksa family member will top the district’s preferential list. With the foundations of the Rajapaksa kingdom shaking for the first time in a decade, the race for Hambantota will be an interesting contest to watch.